First, an NPR Thanksgiving tradition. Many long-time NPR and Michigan Radio listeners will know Susan Stamberg as one of the “Founding Mothers” of National Public Radio. She was the host of All Things Considered from 1972 to 1981, and then went on to host Weekend Edition Sunday from 1987 to 1989. 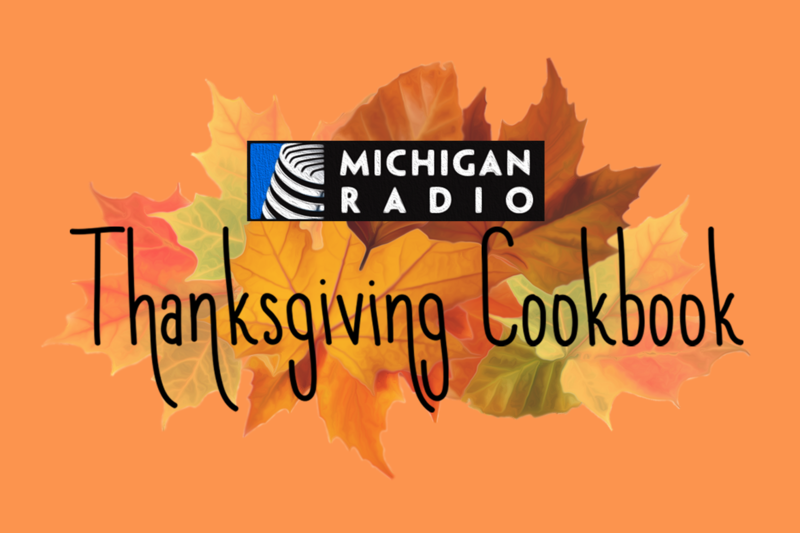 Every year, she shares her Cranberry Relish recipe with listeners across the country, and it’s a dish found on the tables of many Michigan Radio staffers. The relish will be thick, creamy and shocking pink. (OK, Pepto-Bismol pink). 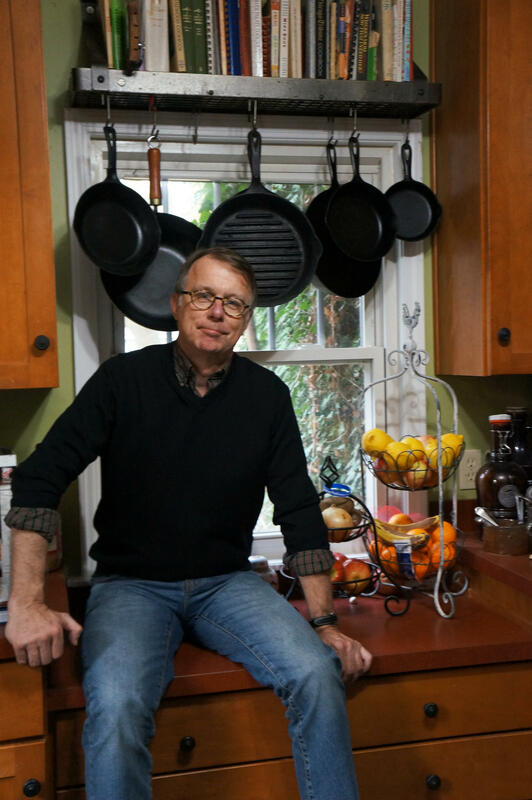 I have my grandmother’s cast iron pans hanging in my kitchen. I love the fact that I fry eggs and pancakes for my kids in the same pans Grandma Ribeiro used to make stuffed pork chops, or scrambled eggs, or green beans sautéed with onions. That’s 70 or 80 years of seasoning on those pans, by my reckoning. I’m the only one allowed to clean them. I’d clear out my kitchen and start over before I’d part with those pans. Capitol reporter Rick Pluta with his grandmother's cast iron pans. This recipe is my go-to for bringing to a Thanksgiving potluck, and, truth is I’ve been told not to show up without this dish. I say “recipe” but it’s really kind of a throw-together thing for me. So, these measurements aren’t gospel. My uncle Wayne used to say the appropriate amount of garlic is “all of it that’s in the house.” I get by with two to four cloves minced. Clean the Brussels sprouts by chopping the stem, and peeling off the outer leaves. Cut the sprouts in half. Toss with the garlic, half the dressing (which you made yourself because that’s the way to do it), and ground pepper and salt to taste. Spread the sprouts across Grandma’s 11-inch pan, lightly oiled. If you don’t have Grandma’s pan, use your own. A roasting pan works fine, too. Pre-heat oven to 400 degrees (or get a little crazy and go to 425 degrees). Roast for 15 to 18 minutes, until the outer leaves are turning brown. Throw in the walnuts and quickly toss. Roast for another five to 10 minutes. Remove pan from oven, and dump the sprouts in a bowl. Toss with some of the remaining salad dressing. You have to taste as you go. You might get by with less than what you have left. Pour six ounces dry white wine in a glass. Enjoy while you wait for Thanksgiving dinner. Place one bag o' cranberries in a pot with 1 cup orange juice, 1 cup maple syrup, and 1 cup Vernor's (or "ginger ale" if you have no interest in keeping it real). Preheat to 375. Arrange potatoes in 13x9 glass dish. Combine sugar, butter, cinnamon, salt, nutmeg, and ginger in heavy small saucepan over medium heat. Bring to boil, stirring until sugar dissolves. Pour over potatoes; toss to coat. Cover dish tightly with foil. Bake potatoes 50 minutes. Uncover, and continue to bake until potatoes are tender and syrup thickens slightly, basting occasionally, about 20 additional minutes. Increase oven temp to 500. Top potatoes with marshmallows and almonds. Return to oven; bake until marshmallows begin to melt - about 2-3 minutes. But watch carefully lest you torch the yams. This “Onion Pie” recipe is a fairly new addition to the annual Lawrence-Dobrusin Thanksgiving celebration… but it is now a staple! The Ritz Cracker crust and Sweet Vidalia onions are an incredible combination. It is a guarantee that if you add this delicious “pie” to the menu for your family’s annual feast, it will be a required Thanksgiving side dish for years to come! Mix Ritz crackers crumbs and melted butter. Press mixture into an 8-inch pie plate. Saute onions with 2 T of butter until clear, not brown. Spoon into pie crust. Beat eggs with milk, salt, and pepper. Pour over onions. Bake at 350 degrees for 30 minutes, or until firm in the center. 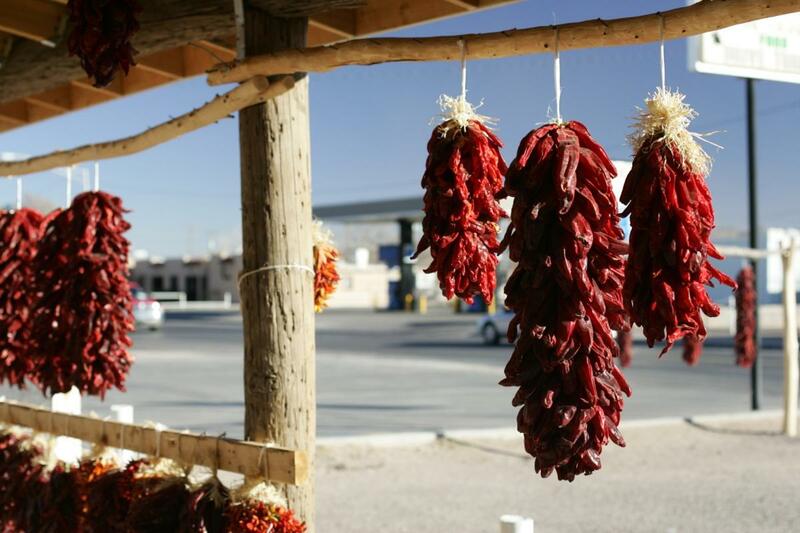 At Thanksgiving, family and friends in New Mexico will most certainly be enjoying some flavorful red chile on their turkey and mashed potatoes. Along with all the traditional fixings, there’s always a huge pot of red chile cooking on the stove. You can sop it up with a roll or flour tortilla or skip the gravy and pour it all over your food. My Aunt Loretta’s red chile is amazing. People eat it by the bowl. My husband, who is originally from the east coast, is obsessed with it. Add canola oil into frying pan stir in the diced pork. Season pork with salt, pepper and granulated garlic to taste. Fry until cooked and most of the liquid from the water in the meat and oil are gone. While pork is cooking, soak the red chili pods in in boiled water. Do not boil the pods - just soak in water that has been boiled. 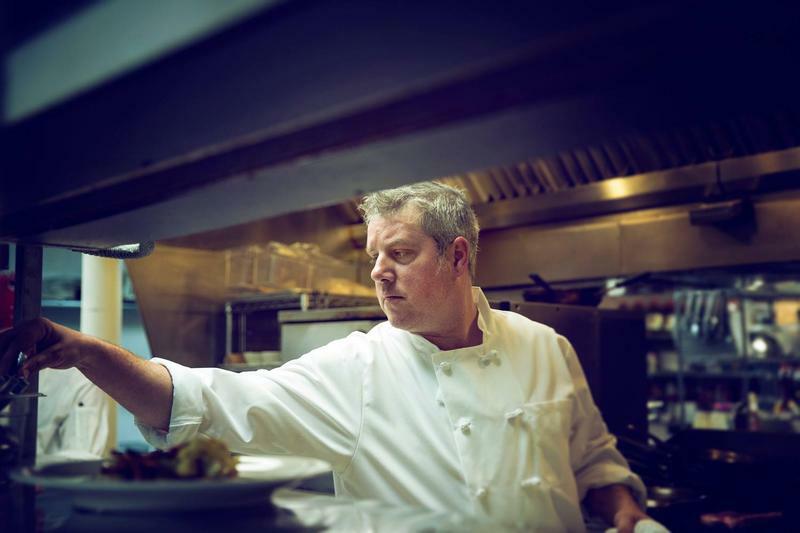 Once the pork is cooked, add the flour and continuously stir over medium heat until the meat turns somewhat crusty and brown. Once the chili pods soften, put the pods into the blender and add the diced garlic, oregano and water. Blend well until the chili pods appear to be blended thoroughly. It should be the consistency of a thick sauce. If it is too thick, you can add more water. Pour the chili sauce into pan with the cooked pork. Simmer at rolling boil while stir continuously until the foam at top disappears. Add salt to taste. Enjoy! So, there it is, if you want to add a little kick to your Thanksgiving meal this year -- go red! This dish is SO special to me. It's been in my family for who knows how long, and my aunt and grandma make it every year. When you don't have turkey to look forward to (shout out to all you other vegetarians out there), this is a great alternative. It makes me happy. Dice green pepper and onion. Saute in butter/margarine until vegetables are soft. On low heat, add tomato soup and softened Cheez-Wiz. Mix well, stirring often. Cook spaghetti (I use thin spaghetti but any spaghetti can be used) to almost done, drain (do not rinse), and add to sauce. Do not add so much spaghetti that it becomes dry. Transfer to a 13 x 9 dish and bake at 350 degrees for 45 minutes. This recipe is for a 13 x 9 dish but can be modified for a smaller portion. Can be made in advance and stored for cooking later. This is my sister-in-law’s family recipe that I adopted about 10 years ago and is now a favorite for every Thanksgiving. It’s a bread! It’s a vegetable! It’s a starch! It’s got it all plus it’s super easy and delicious, so I also love bringing it to potlucks. Mix all ingredients and pour into baking dish. My grandmother was a terrible cook (her turkey would fall off the bones because it was so dry), so we tended to load up on snacks prior to the meal. Toxic Hot Dip isn't the original name for this chip dip, but given how long it lasts, the lack of any nutritional value, and how hard it is to scrape off the sides of the bowl when it’s finally gone, the name is apt. It's the kind of chip dip that you can only have once a year, although my grandmother would trot it out at Christmas, New Year's, and Easter-basically any time there was a major holiday. My mom hasn't made it in years, but if she were to make it would be the only time she would be caught buying Kraft. Yes, you must use the exact brands, otherwise it's not Toxic Hot Dip. Cut the Velveeta into cubes, place in a medium microwave safe bowl. Pour the chili over the cheese. Place in microwave on high for 2 1/2 minutes. Be sure to put a paper towel over the top of the bowl to prevent bubbling over. Remove and stir. Put it back in the microwave for another 2 1/2 minutes. Microwave until cheese is melted and the paper towel sticks to the edge of the bowl. Serve with a side of Fritos and tortilla chips. Tip: Flavor and texture improves with age and additional microwaving. My Grandma Ruthie was a very petite lady. Any mini version of an otherwise normal object, be it a tiny spatula or a little juice glass, will always be “Grandma-sized” in my mind. Don't mind the Christmas-themed stationary. Grandma Ruthie's recipe is perfect for all holidays! These pepperoni cocktail snacks are the ultimate “Grandma-sized” treat, as well as a staple at all of our holiday parties. They’re the perfect bite-sized combination of salty, cheesy goodness. (And if you have picky eaters in your family, fear not: this is the recipe that let my mom trick me into eating spinach as a kid). Mix the spinach, cheeses, onion, oregano, and garlic well. Add the eggs. Lightly spray a mini-muffin pan. Place a pepperoni in the bottom of each cup, then fill with the mixture. It was November 1978 and my husband Sean and I were preparing to celebrate our first Thanksgiving in our first house. No more little apartment kitchen! I wanted to do it up right in my “real” kitchen. The original copy of Mary Anderson's Harvest Loaf Cake recipe. Back in those days the Detroit newspapers both published nice big holiday recipe sections. That year, the Detroit Free Press featured recipes submitted by its readers. There was one that caught my eye immediately. It was called Harvest Loaf Cake, chock full of pumpkin, spices, and chocolate chips. The nice lady who’d submitted the recipe was named Mary Anderson of Livonia. Her photo reminded me immediately of my Aunt Irene, which was wonderful because I dearly loved my Aunt Irene. So I baked Mrs. Anderson’s Harvest Loaf Cake. We loved it. The pumpkin kept it moist, the chocolate was the perfect touch, and the ginger, nutmeg, cloves and cinnamon seemed to fit the holidays. It was such a hit that I have made Harvest Loaf Cakes every single holiday season since then. I’ve typed out the recipe. But the baking session doesn’t feel complete until I haul out the now 39-year-old Free Press section. I want to see the original, complete with my notes for doubling or tripling the recipe. Even more importantly, I want to see Mrs. Anderson’s smiling face in the accompanying photo. It just wouldn’t feel like Thanksgiving without her. Through the years, I’ve talked about this recipe on the radio, and every year, I get emails and Facebook requests from listeners who want to make their own Harvest Loaf Cakes. I’ve never heard from Mary Anderson of Livonia, or any members of her family. But I sure would like them to know: she and her Harvest Loaf Cake will always be part of our Thanksgiving and Christmas tradition. Cream butter and sugar. Add eggs, beating well. Stir together flour, baking soda, cinnamon, salt, nutmeg, ginger, and cloves. Add to butter mixture alternately with pumpkin, beginning and ending with dry ingredients, beating well after each addition. Stir in chocolate chips and 3/4 cup walnuts. Cyndy with her favorite Thanksgiving treat. Pour batter into greased 9x5x3-inch loaf pan. Sprinkle with remaining walnuts. Bake at 350 degrees for 65 minutes, or until done. Cool cake. Drizzle glaze over cake. Stir together ingredients, and drizzle over cooled Harvest Loaf Cake. My wife Debra and I lived in Louisville, KY for six years. We added quite a few recipes for our holiday table. One favorite is bourbon balls. Mix the vanilla wafer crumbs, pecans and 1 cup confectioners' sugar in a medium mixing bowl. Add corn syrup and bourbon. Stir to mix well. Shape into small balls. Should be about 50 bourbon balls. Roll in 1/2 confectioners' sugar to coat. Store in a foil-lined container in the refrigerator until ready to serve. The longer the bourbon balls sit, the better they will be. My wife makes this pumpkin pie every year. It's a recipe handed down from her mom, Barbara Bell, that she first came up with in 1956. Barbara Bell's 1956 pumpkin pie recipe. The recipe calls for 1 cup of pumpkin, which is normally canned pumpkin filling. A few years ago there was actually a shortage of pumpkin pie filling and my wife had to visit several stores to find any. That Thanksgiving, after a particularly frantic day of baking and cooking, she pulled the pie out of the oven and we all noticed that it looked rather pale, without it's usual lovely caramel brown color. When we tried a piece we discovered the problem: she had completely forgotten to add the pumpkin filling that she had searched so hard to get! Believe me, brown sugar and scalded milk pie is nothing to write home about! We all had a good chuckle over that and my wife completely denies that the glass or two of wine she had that afternoon had anything to do with the mistake! Mix the ingredients well. Add to pie crust. Bake at 425 degrees for 15 minutes, then at 350 degrees for an additional 45 minutes. Food always tastes better when someone else makes it for you. 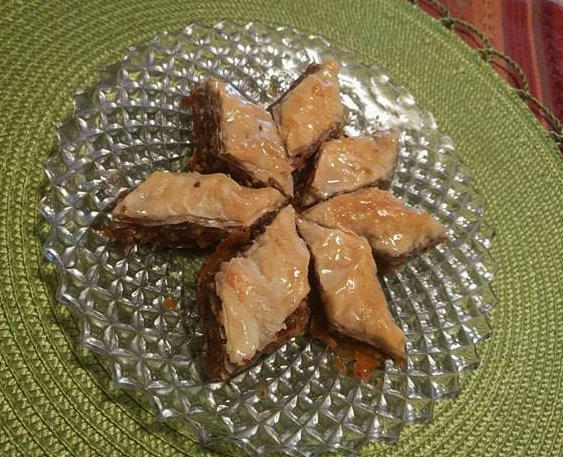 That’s why my favorite Thanksgiving dessert is my Aunt Olivia’s baklava, which is sticky, flaky, heavenly goodness. Purchase a one-pound package of phyllo (or Fillo) pastry sheets (available at Russo’s International Market in GR, certain Meijer stores, and most international grocery stores). Let thaw unopened in refrigerator a couple of days before using. Combine together and set aside. Cook sugar, honey, and water until beads form — about 10 minutes. Add juice from 1/2 lemon. Grease a large 16x10 pan. Once you have the filling and syrup made, open the package of phyllo sheets, place on counter, and cover sheets with a damp tea cloth. Now you’re ready to assemble the baklava. Begin alternating layers of phyllo, butter, and filling. First put 2 or 3 single layers of phyllo sheets in pan and use spatula to butter the sheets, covering entirely. Then continue to layer one sheet at a time, butter the sheet, then sprinkle filling mixture. Continue layering one sheet, then butter, then the filling until all the filling is used. Put the last 3 layers of phyllo on top without the filling in between, then butter again. Cut partially into diamonds (first three layers) with sharp knife. Bake in 350 oven for about 30 minutes or longer—until brown on top. Take out of oven and pour entire syrup mixture over it. When cool, cut with sharp knife. This recipe makes 80-90 pieces. We fondly refer to this recipe as "pink stuff." My grandma made it for every family get-together for as long as I can remember. Sometimes it's actually "orange stuff" - it just depends on the holiday. A helpful tip from Jodi's mom, Rosemary. If you make this for Thanksgiving, I highly recommend using orange Jell-O to coordinate with your Thanksgiving table settings. Also recommend providing plastic cups so your guests can keep it away from the warm food on their plates - it will melt! Prepare Jell-O according to the packaging (2 cups boiling water, 1 cup cold). Set in fridge for one hour - until it is like an egg white consistency. 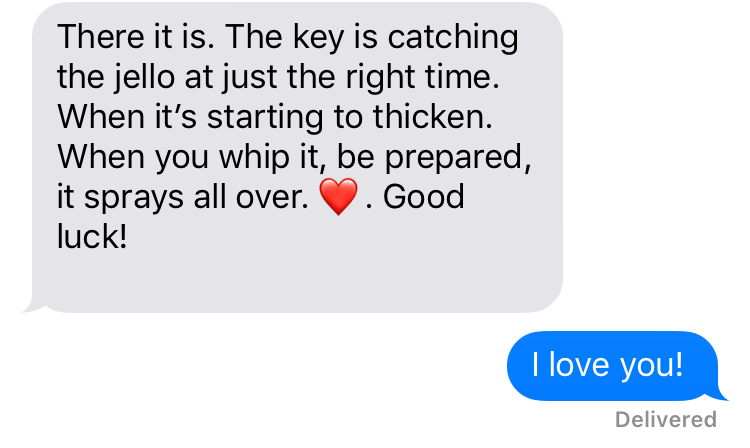 A note from my mom: The key is catching the Jell-O at just the right time, just when it's starting to thicken. When you whip it, be prepared: it sprays all over! 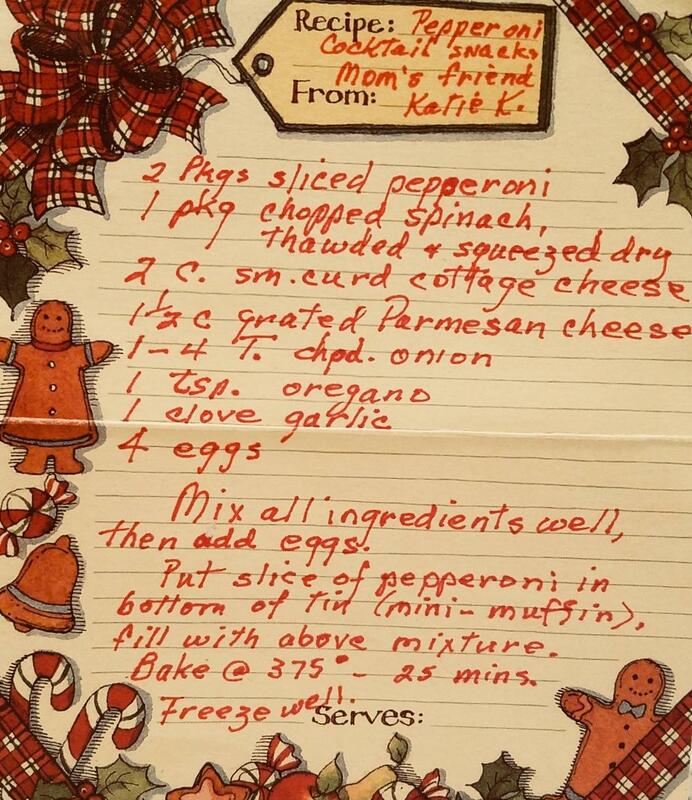 This is a recipe my mom found somewhere (she doesn't remember where) when I was a kid in Mitchell, South Dakota (home of the Corn Palace). 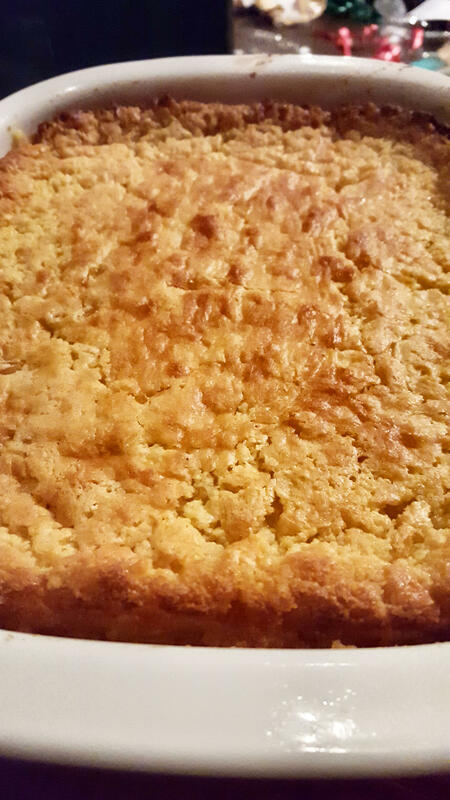 It's the most delicious homemade bread I've ever had, and the one recipe that says Thanksgiving to me more than any other, mostly because I associate it with my mom, and helping her in the kitchen when I was little. The nutmeg and lemon peel make it delicious, and it's really good to make sandwiches with leftover turkey the day after. Cook the potato in water; drain reserving 3/4 cup water. Cool to 110ºF. Mash potato until smooth, then measure 1/2 cup, add milk and butter. In large bowl, soften yeast in potato water for 5 minutes. Stir in condensed milk, sugar, eggs, nutmeg, lemon peel and the potato mixture. With a wooden spoon, gradually stir in ~4 1/2 cups flour (I use the mixer and dough hooks). Spread remaining 1/2 cup flour on a board and turn out the dough onto it. With floured hands knead dough adding flour as needed to keep it from sticking to hands. Knead until smooth. Let rise, covered, in greased bowl until doubled in size (~45 minutes). Turn out of bowl onto lightly floured board and knead 2 or 3 times. Lightly grease cookie sheet, form dough into 1 large loaf or 2 small rounds – or shape into rolls. Cover and let rise for ~45 minutes. Bake at 325º for 50 minutes (loaves), or 400º for 12 minutes (rolls). Cool on a wire rack. 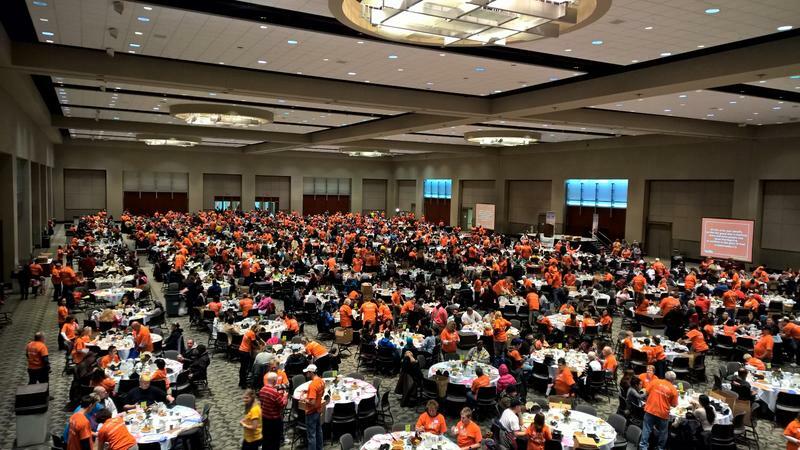 A Christian organization dedicated to helping the homeless served more than 2,000 people a free Thanksgiving dinner Thursday. The group, Mel Trotter Ministries, got more volunteers than it could use. Volunteer coordinator Paula Seales says a week ago, she had 756 volunteers signed up to help serve the free dinner in downtown Grand Rapids. By Thursday, it was close to 900. She had to put some people on a waiting list and turn some people away.